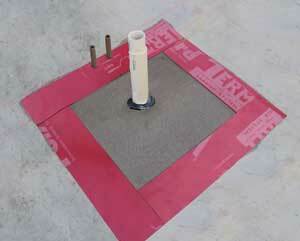 The TERM All Pest Bath Trap Barrier is installed after the concrete slab is poured and rough plumbing is complete. The non-chemical barrier blocks termites, fire ants, rats, mice and moles from entry through bath traps (blockouts) in a slab. The components include TERM Particle Barrier, liquid adhesive/primer, TERM 018 Micro Mesh Barrier, TERM Flashing Barrier and TERM Sealant Barrier. Although the system blocks pests, the porous nature of its components allows water to drain from the bath area into the base below. Under normal circumstances, application of pesticides to the bath trap area should be unnecessary during the life of the structure, and no maintenance should be required.